BURKE COUNTY, NC – A fire destroyed dozens of storage units and shut down portions of U.S. Highway 70 for hours on Wednesday morning. Firefighters responded to an active fire at Bingham Storage, located at 1068 U.S. 70 in Valdese, around 10 a.m. Wednesday morning. Additional images from Steve Ohnesorge and Dave Faherty. One storage building that held more than 40 units had gone up in flames. “Highway 70 is still closed until further notice, but will hopefully reopen in the next few hours,” said Chief Charlie Watts with the Valdese Fire Department at around noon. As of noon the fire was slowed down, he said. 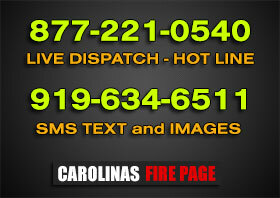 The cause of the fire has not been determined but Burke County Fire Marshal Mike Long has deemed it an accidental fire. He is looking at surveillance video from the site, according to Watts. “An investigation is still in progress,” Long said. The location of the fire meant it was in the jurisdiction of two different fire departments, and all hands were at the scene to help battle the blaze. “The fire is actually on the line between Valdese and Triple Community. So the chief at Triple, Tim Williams, and myself from Valdese, we are kind of co-taking care of things,” said Watts. Around 10:45 a.m., firefighters were trying to cut the fire off to keep it from spreading any further to the west and were making headway, according to Watts. “It is a little difficult because we do not know what is in those storage units, it could be anything,” he said. Some firemen were atop the storage building roof cutting parts of it to ventilate the structure, he said. “I haven’t had this many (departments) in town in a while,” Watts said. Along with Valdese and Triple Community fire departments, Lovelady, Icard Township, Enola, Drexel, Chesterfield, Salem, Rhodhiss, Oak Hill, North Catawba, Hickory, Longview, Mountain View fire departments responded to the scene. Valdese Police Department, Burke County Fire Marshal’s office, Burke County EMS and Burke REACT were also on scene. Highway 70 reopened around 2:15 p.m.